The Power will rue some missed chances, but also the five goals from centre bounce clearances they allowed to the Eagles, having been the No.1 ranked team at scores from centre bounces this season. A great win for the Eagles on the road who made more of their opportunities despite a 6839 inside 50 advantage to the Power. Only Gold Coast (74 in round 1 against Brisbane) has had more inside 50s than the Power currently have (67) and lost the game this season. 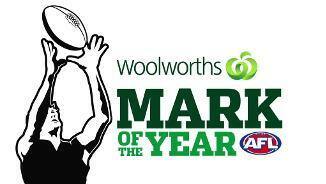 Another goal to the Power that was launched by Paddy Ryder, who has now launched six scores for Port Adelaide. The Power now lead in forward 50 marks (125), forward 50 tackles (12-1) and shots at goal (26-19). The Eagles make it three goals from three inside 50s in the final quarter, this time with a chain started in the defensive 50. West Coast has scored 4.2. (26) from such chains, and the Power are yet to score from a chain started in the defensive 50. All three of the goals to Port Adelaide in the final quarter have come intercepts in the attacking midfield, as it finally starts to punish these turnovers by West Coast. The Power lead inside 50s (92) in the final quarter, but both teams have scored two goals from these entries. The centre bounce clearances continue to cause the Power problems, with five goals now to the Eagles from this source, despite Port Adelaide winning the centre bounce clearances 1310. Charlie Dixon having a monster game for the Power now has a gamehigh 127 ranking points, and a game-high 14 contested possessions. The Eagles again get the opening goal of the quarter, and once gain have punished a Power turnover. Yeo has had 12 contested possessions, five intercept possessions and launched two scores for the Eagles. Paddy Ryder leads the Power for clearances (five) and score involvements (eight), and is equal leader for contested possessions (13). West Coast has continued to be more efficient than Port Adelaide who trail despite having had four more shots at goal, more inside 50s (4931), and more forward 50 marks (8-4). Paddy Ryder and Charlie Dixon each have 13 contested possessions for the Power (no team mate has had more than eight). An excellent set shot from Mark Le Cras punishes the Power turnover. The Eagles have now scored 3.1. (19) from eight forward half intercepts. The Power have scored 1.6. (12) from 25 forward half intercepts. Port Adelaide has had 45 disposals in its forward 50, but only 49 percent have been effective. West Coast has has had just the 25 disposals in the forward 50, but 76 percent have been effective. Port Adelaide lead in forward 50 tackles (111), with this pressure contributing to the ball staying in its forward half for long periods. Finally the Power get a goal through Charlie Dixon after having the last nine inside 50s. Dixon has an equal gamehigh 12 contested possessions (including five contested marks). The Power with the last six inside 50s of the game, but have returned just three points, and now scored 1.5. (11) from shots at goal on the run. Josh Hill makes it four goals in a row to the Eagles, and now has a gamehigh eight score involvements, including two goals and two assists. West Coast with three goals to start the third quarter, now have forward half kicking efficiency of 69 percent compared to the Power 45 percent. Four goals from centre bounce clearances now for the Eagles which is their best return from this source in 2017. West Coast get the opening goal of the third quarter on the back of some good forward half pressure. The Eagles have scored 1.1. (7) from five attacking midfield intercepts. The Power have scored just two points from 16 such intercepts. 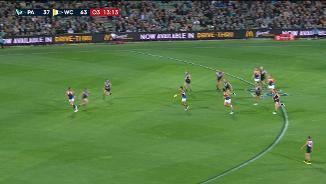 Port Adelaide had 26 spoils in the first half, but only gained possession from five of these. West Coast gained possession from eight of its 16 spoils. Port Adelaide has had more control in general play (inside 50s now 3219), but West Coast has been more efficient and scored three goals from centre bounce clearances in the first half. The Power had seven of the last eight inside 50s to end the second quarter, but could only score 0.3. (3) during this period. West Coast is ranked last this season in ground ball gets, but currently lead 5648 in this area. Matt Priddis already has 11 contested possessions (no other player has more than seven), and also gamehighs for clearances (six) and score involvements (six). Power InterchangeCharlie Dixon off due to an injury. West Coast lead 95 in one-on-one contest wins. This season the Eagles have won just 25 percent of offensive one-on-one contests (ranked 16th), while the Power have won 39 percent of their defensive one-on-one contests (ranked first). The Eagles now with six goals from just the 13 inside 50s. This season West Cast has scored a goal from 28 percent of its inside 50s (ranked fourth). Port Adelaide has retained possession from just 33 percent of its 18 inside 50s, while West Coast has retained possession from 75 percent of its 12 inside 50s. 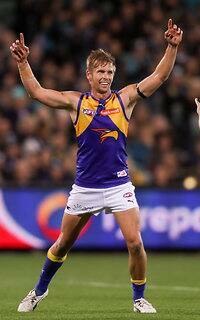 The Eagles now have three goal from centre bounce clearances, as Ryder hobbles from the ground for Port Adelaide. The Power had only conceded six goals this season from this source prior to today. Eagles InterchangeMark Hutchings off due to the blood rule. Power InterchangePaddy Ryder off due to an injury. The Power get the opening goal of the second quarter from a forward half stoppage. Port Adelaide average 19 points per game from this source (ranked second). Mark Le Cras with three first quarter goals for the Eagles, had 25 shots at goal and just three score assists in the first six rounds. Only two players in the AFL had a higher ratio of shots at goal to assists. An even first quarter, with the Power having more of the play (inside 50s 1610), but the Eagles making more out of their chances with better kicking efficiency in the forward half (63 percent to 44 percent). The Eagles lead in clearances 1311, but have been able to be more effective with their clearances, and lead in scores from stoppages (19-7). 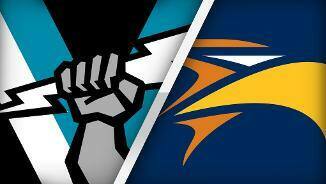 These two teams are ranked one (West Coast) and two (Port Adelaide) for intercept marks this season. The Power have already taken nine such marks, and average 18 per game. Port Adelaide has had 10 of the last 12 inside 50s, but only scored 1.2. (8) during this period of dominance. 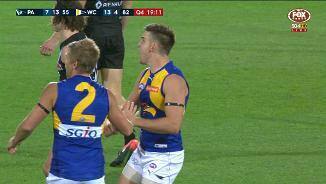 Eagles InterchangeDom Sheed off due to the blood rule. Port Adelaide has already generated 13 intercepts in the attacking midfield, but is yet to score from any of these. This season the Power average 36 points from 22 such intercepts. 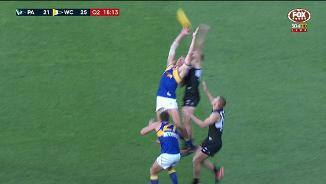 The pressure of the Power has contributed to West Coast having already recorded nine clanger kicks. This season it has averaged 22 such kicks per game. Power InterchangeRobbie Gray off due to an injury. Charlie Dixon getting an early goal for the Power, and he has been the target of three of their five forward 50 entries. Only Tom Lynch (Gold Coast) with 77 has been the target of more inside 50s this season than Dixon (66). Port Adelaide is yet to win a clearance at a centre bounce, with the last two goals for the Eagles coming from this source. The Power are ranked No.1 in scores from centre bounce clearances. 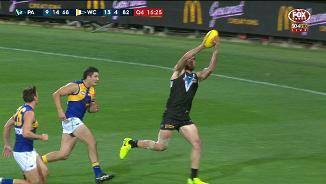 A clever intercept and snap from Wingard gives the Power their opening goal. Port Adelaide average 11 points per game from forward 50 intercepts. West Coast scores the opening goal of the game, launched by a Barrass intercept mark in the defensive 50. The Eagles have generated an inside 50 from just 17 percent of their defensive 50 chains this season (ranked 17th). The Power conceding the opening centre bounce clearance to the Eagles, have scored more from this source than any other team, and have an average differential in scores from centre bounce clearances of 11 points (ranked No.1). The Eagles have some of the leading players in the AFL for intercept marks. Elliot Yeo ranks No.1 in the competition for such marks this season with 24, Jeremy McGovern ranks third with 22, and Tom Barrass equal seventh with 15. Port Adelaide has averaged 13 more inside 50s per game than its opposition this season, which is the best differential of any team. The Power have averaged 42 points from forward half intercepts this season (ranked first), and 19 points from forward half stoppages (ranked second). West Coast has won 16 fewer groundball gets per game than its opposition (the worst differential of any team), but has taken six more contested marks than its opposition per game (ranked first). Welcome to Adelaide Oval for the Port Adelaide v West Coast Eagles Round 7 clash. WEST Coast's love affair with Adelaide Oval is turning from a fling into a full-blown romance, after holding off a fast-finishing Port Adelaide by 10 points on Saturday night. Leading by 27 points in the early stages of the final term, the Eagles hung on for their fifth win of the season – 15.7 (97) to 12.15 (87) – in front of a crowd of 38,333. The Eagles have now won five of their six games at the venue, which has similar dimensions to Domain Stadium. The narrow flanks were perfect for the Eagles to apply their suffocating defence and harass the Power any time they went inside the forward 50. 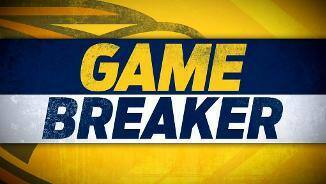 Midfielders Matt Priddis (26 possessions), Luke Shuey (26) and Andrew Gaff (25) found plenty of the ball, opportunist forward Mark LeCras booted four goals and defenders Tom Barrass (19 and nine marks) and Brad Sheppard were also influential. Barrass grabbed everything in sight in the backline with his intercept marks shutting the Power down at every opportunity. Sheppard was given the tough task of marking Power star Robbie Gray, keeping him goalless. "I'm really proud of our players and our backline in particular for handling 68 inside-50s," Eagles coach Adam Simpson said after the game. "I don't think we gave up the lead, so we started well, which is important here, and we responded well when they scored. "The start of the third quarter, when we jumped out of the blocks, set us up." Key forward Charlie Dixon had one of his best games for the Power since joining the club at the start of last season, presenting a strong target in the attacking 50 to finish with three goals and 22 possessions. 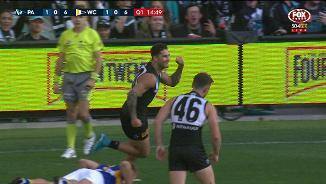 Chad Wingard's move from dangerous forward to exciting midfielder continues to reap dividends for the Power. Brad Ebert – in his first game since becoming a father last Tuesday – crashed into plenty of packs and Paddy Ryder (42 hit-outs and 17 contested possessions) was dominant against the Eagles' second-string ruck combination. The Eagles appeared to be home when Elliot Yeo – excellent off half-back with 27 possessions and 10 marks - extended the margin to 27 points in the first minute of the last quarter. Goals to Travis Boak and Charlie Dixon narrowed the gap to 14 points, before Josh Kennedy responded immediately for the Eagles. Power half-back flanker Matthew Broadbent then unleashed a bomb from 55m to bring the crowd to its feet. 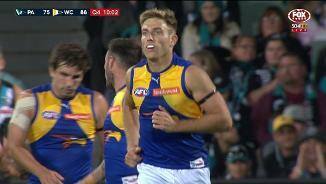 But Sheppard ran forward to restore a 19-point margin for the Eagles. 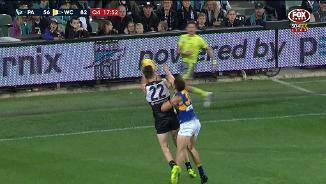 The Power continued to surge, Justin Westhoff converting from a set shot before Ebert took a great grab to bring his side back to within seven points at the 23-minute mark. 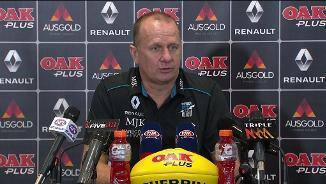 "West Coast played their game style better than we were able to play ours," Power coach Ken Hinkley said. "We had plenty of opportunities, 68 entries to 39, to create better scoring, some of that was inaccurate kicking, some of that was their ability to mark and intercept the ball in our forward 50. "That's their style of football they play and we weren't able to put enough scoreboard pressure on them." 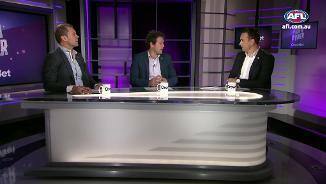 The Eagles will now turn their attention to a clash with the reigning premiers, the Western Bulldogs on Friday night, while the Power are off to China to face Gold Coast in Shanghai next Sunday. Port Adelaide: The Power appear to have a clean bill of health ahead of next weekend's trip to China. West Coast: Midfielder Liam Duggan was a late scratching after failing a fitness test on his injured quad. "His corkie bled a fair bit He trained yesterday and trained pretty well, but he was one knock away from being very sore, so we took the conservative approach. Our plan is to get him for training on Tuesday," said. 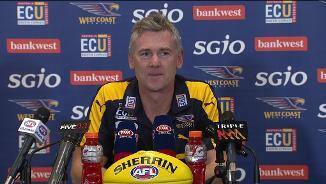 Eagles coach Adam Simpson. Mark Hutchings took Duggan's place in the side. The Eagles didn't sustain any injuries during the game. The Power will embark on their historic first game in China when they take on Gold Coast at Jiangwan Sports Stadium in Shanghai next Sunday at 1.15pm local time (3.15pm AEST). Meanwhile, the Eagles have a six-day turnaround before facing reigning premiers, the Western Bulldogs, at Domain Stadium on Friday at 6.10pm AWST.